The worlds first cooling off the grid solar air conditioner, uses no electricity. This most recent innovation in stand alone power saving, operates 100% Off Grid, providing the ultimate energy savings with cost effective clean green solar air conditioning comfort. SolAir World International’s 100% Off Grid operates by using a combination of solar power and battery storage, effectively reducing operating costs by 100% during the day and night. SolAir World International has a vision to protecting the environment with lower energy consumption putting more money back in your pocket. Beware of imitations that say they are 100% Solar, these units require 220/240 volts to run indoor unit. 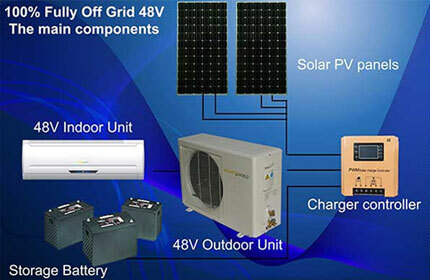 Run by solar during the day and battery through out the night, which is charged FREE by the Sun! Finally 24 hour Cooling & Heating that costs you absolutely Nothing to Run! Typically, a solar aircon can cost between $1,800 to $2,000 excluding installation fees. Well it may sounds expensive at first but think about the life time energy bills you can save far exceeds this one time cost. So speak with us to learn more about how this works.